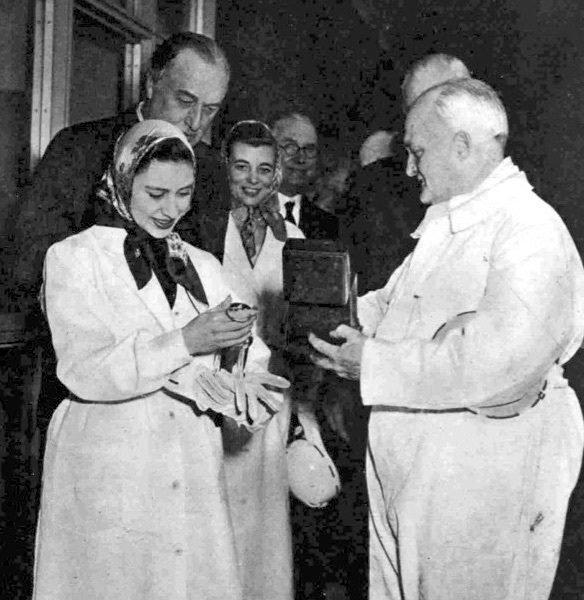 April 7: Visit by HRH Princess Margaret to see 9's Face. 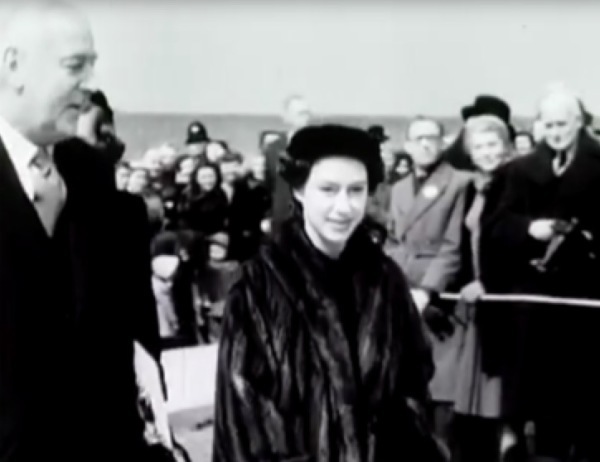 HRH Princess Margaret, the sister of the reigning monarch, goes down the mine! The Princess arrives in a mink coat. But soon changes into a more befitting outfit. 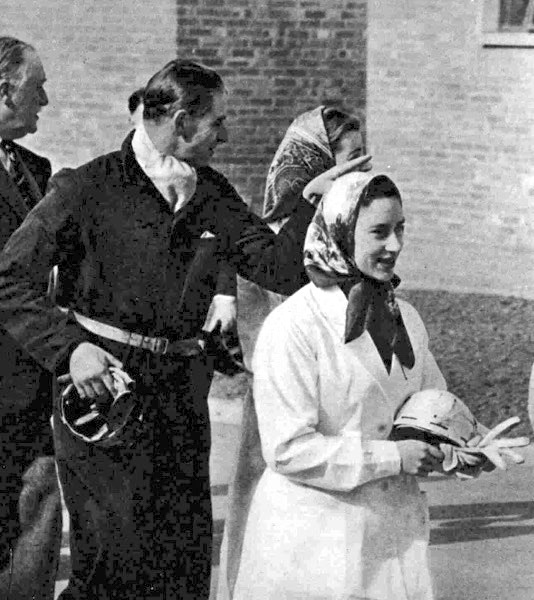 Wearing a white helmet and white overall Princess Margaret stepped into the cage of Britain's super-de-luxe colliery at Calverton, near Nottingham, this afternoon. Then she zoomed 1680 feet down the shaft to watch the miners at work. To conform with regulations she wore a wood pulp helmet and carried a lamp. Before she stepped into the cage she was asked by 51-year-old banksman (Pithead overseer), Douglas Pickering, to leave behind any matches, her lighter or anything that was likely to cause a fire. The Princess travelled 1,200 yards from the pit bottom on a Diesel-drawn train. Then she walked 50 more yards to the face. For the first part of the journey fluorescent lights shone overhead. But later the darkness was pierced only by the handlamps carried by the Princess and the conducting party. At the four-foot pit face, the Princess was bent almost double as she clambered among the pit props. She shone a handlamp along the face and said: "It goes for miles." Then she listened intently as Mr Alan Hill, area general manager, explained the work done at the face. She watched a coal-cutting machine at work, operated by Mr Fred Croome, of Bulwell, and Mr Joe Redhill, of Calverton. Soon a cloud of dust began to rise as the cutter did its work. The Princess grimaced as the coal dust got into her mouth. She was then asked if she would like to try her own hand at mining. She grasped the clean white shaft of a miner's pick and, after four short swings with the pick, only a trickle of dust fell. "Try along here, ma'am," said Mr Hill, "it might be better." After two short swings with the pick, she had hewn her piece of Nottinghamshire coal. For the rest of the tour the Princess carried her piece of coal in her gloved hand. When the Diesel train returned to the pit bottom, the Princess, sent for the driver, Mr Frank Sutton Gee, a 26-year-old married man from Arnold, and thanked him for the smooth ride. "It will be something to tell my wife," said Mr Gee. 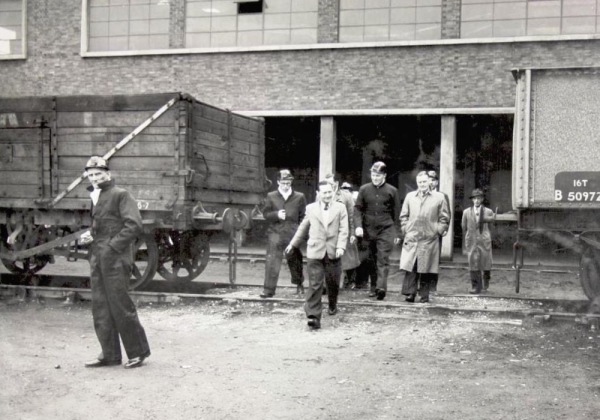 She told the colliery manager, Mr J. Sheldon, that it had been a "wonderful experience." Ready for the descent. With a scarf around her hair and a miner's white helmet in her hand, the Princess steps out for her first trip to the coal-face. During her visit, made at her request, the princess descended the 1,680ft. shaft and returned about an hour later with hardly a hair out of place, with only the faintest smudge of coal-dust on one cheek. It said much for modern mining methods that the Princess's white overalls had only one black mark on the side and her brown brogue shoes were covered with only a slight film of dust. 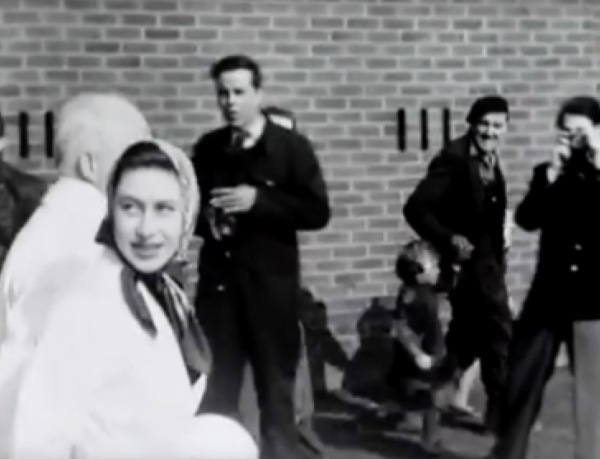 ​Earlier, the Princess inaugurated a new colliery at Cotgrave, Nottinghamshire, by cutting the first turf on the site. Arriving from London by air, she was greeted by Sir Hubert Houldsworth, chairman of the National Coal Board. In the new colliery two shafts are to be sunk nearly 700 yards to develop reserves estimated to yield 200,000,000 tons from eight seams. The daily output will eventually be 5,000 tons, the colliery will employ 2,300 men. 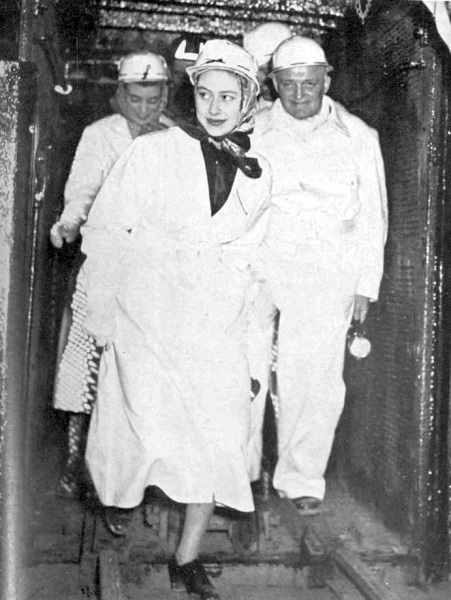 The Princess is seen coming out of the pit cage after spending an hour down the mine; with her are Mr Alan Hill, the area general manager, and Miss Iris Peake, her Lady-in-Waiting. 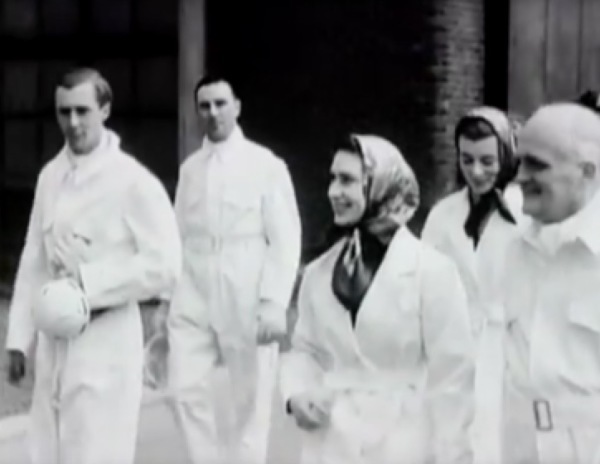 Carrying a safety helmet and wearing white overalls : Princess Margaret returning after descending the pit at Calverton. Receiving a souvenir Miner's Lamp from Mr Alan Hill, area general manager. Miners and their wives watch her go. She travelled three-quarters of a mile along the 9ft high underground roadway in an open Diesel-hauled train to reach the coal-face. She emerged from the mine with just one faint coal smudge on her face. 1956 : June 18 : Russian mining engineers visit. Here they tour the mine accompanied by area officers, colliery manager and union representatives. February : Installation on 41's coal face. This was the world's first full-face of self-advancing roof supports - Dowty Roofmasters. Operating in conjunction with a trepanner cutter-loader, this was to revolutionise longwall coal mining. This gave a saleable output per week of 2,120 tonnes at a face OMS of 172.4 cwt. 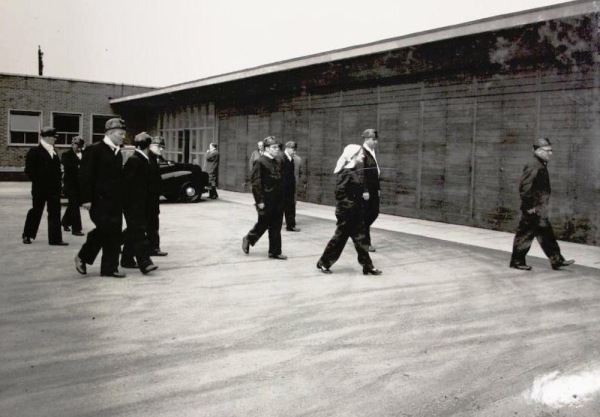 To see their company's products in use, Dowty group executives go down Calverton colliery. 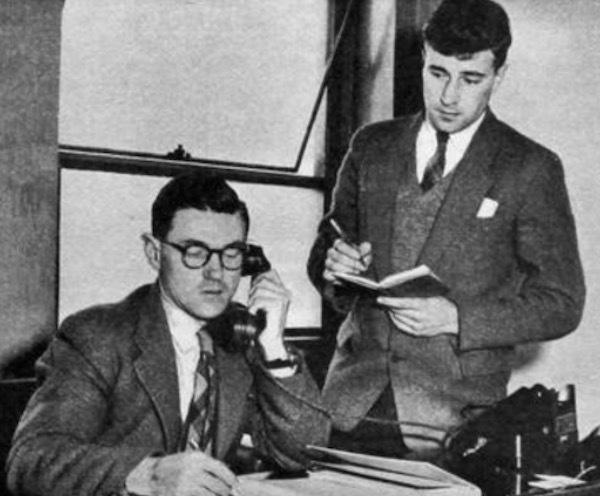 Left to right: Dowty Mining Equipment Co. mining manager M. Potts; Calverton agent-manager W.T. Elliott; public relations adviser C.G. Irving; Miss B. Wallis, secretary to Sir George Dowty; joint publicity manager G.R. Edwards; service manager A. Hodkinson. Calverton Colliery agent-manager W.T. Elliott going over plans. 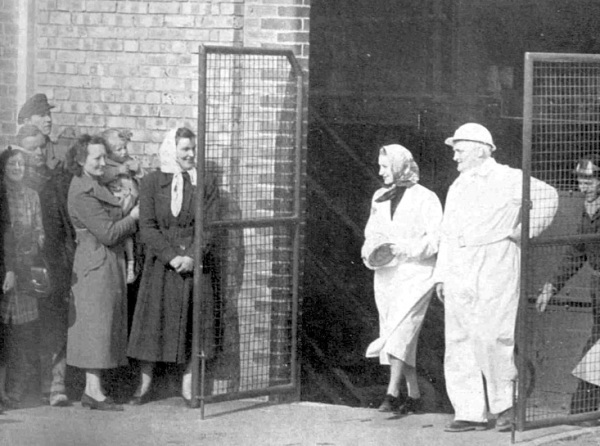 June : Leader of the Labour party, Hugh Gaitskell visited the colliery. He crawled 30 yards down a 3ft 6inch seam to see a machine cutting coal. With him here is N. R. Smith the area general manager. The November 1959 record was smashed in the week ending January 23, when the colliery produced 24,414 tonnes at an overall OMS of 64 cwt. and a face of 159 cwt. 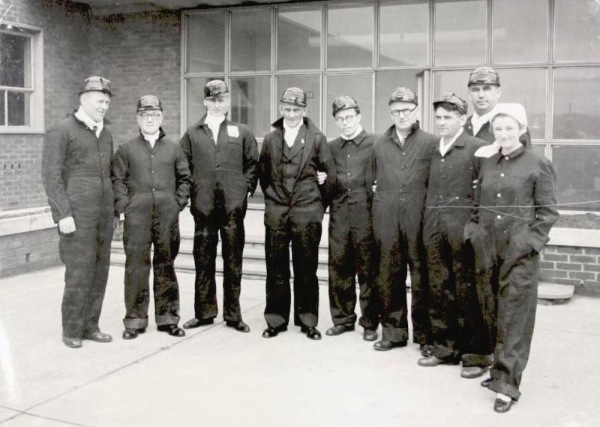 ​Interviewed, at the time, agent-manager William Elliott said how the 1700 men had been recruited from all parts of the country and that it was impossible to find enough men at neighbouring collieries. 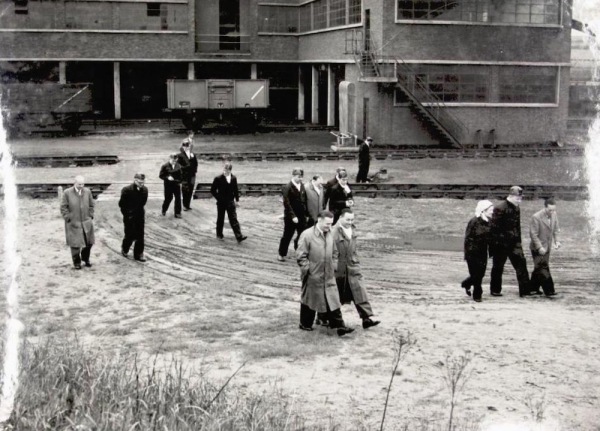 Mr Elliott then stated that, "The attraction was new housing, we built 900 new houses here at Calverton, 360 near Gedling Colliery, a small estate between here and Nottingham and another small estate near Bestwood colliery. 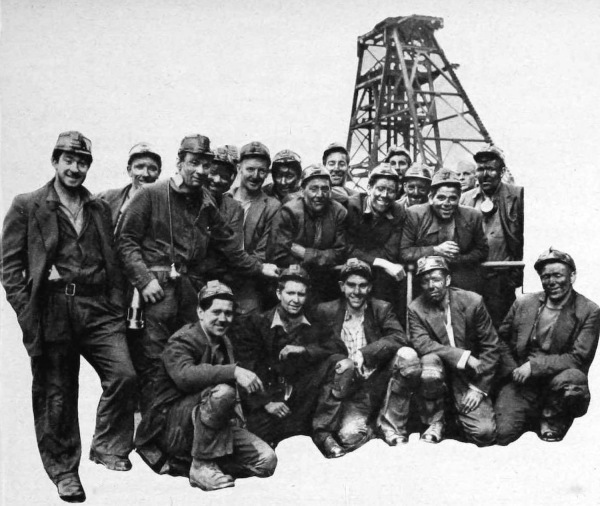 So there was no difficulty about finding the men, and they came from pretty well every coalfield." 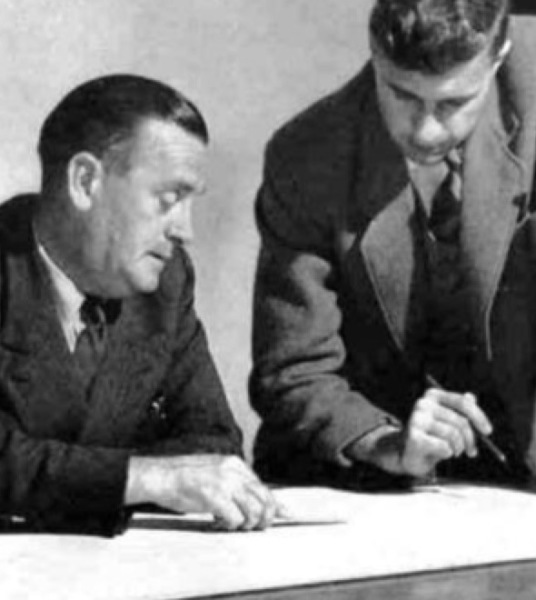 Agent-manager W.T. 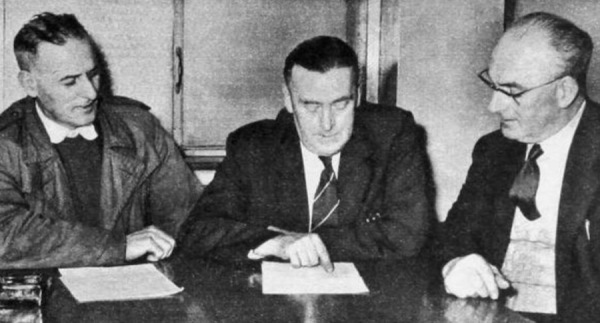 Elliott (centre) gets together with NUM secretary Tom Blant (left) and NUM chairman Jack Bland. Mr Elliott was previously at Hucknall as undermanager and came to Calverton first as assistant manager. He has had 37 years in the industry. Workmen's inspectors, Jim Tatters and Fred Croome have a chat outside the NUM office. 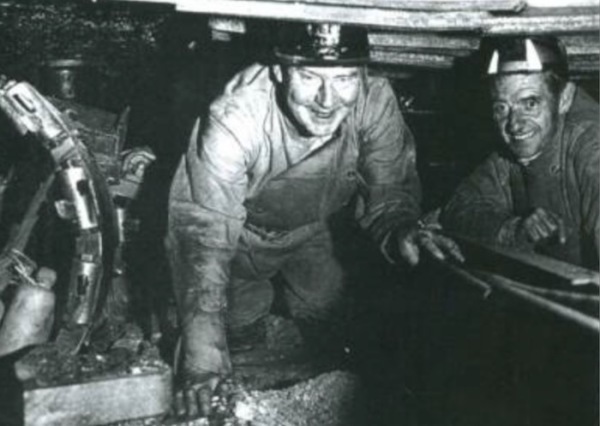 Jim came from a Durham coalfield but Fred is a local man, having been at various pits in the Nottinghamshire area. 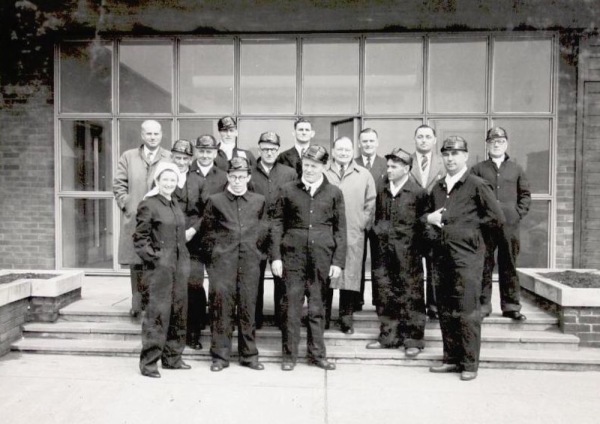 One of Calverton's power-loading teams who helped to set new productivity records. So how did the new cosmopolitan community settle down? At the time, NUM secretary Tom Blant said this, "We had some trouble at first. But it's amazing how people have settled in. We fall out sometimes, but relations between management and men are very good indeed. There haven't been any withdrawals of labour in my time as NUM secretary. Conditions in the High Main seam are notorious. Sometimes they're good, sometimes they're bad. But with good management and good men we've achieved good results and good relations." Workmen's inspector, Jim Tatters, was a typical immigrant. He came to Calverton from Unsworth colliery, Durham. He stated, "It has welded into a very good community. Calverton has attracted the type of man who wants to move to a higher standard of living." The new community really did weld together in many different ways. Off-shift the men could relax in a temporary institute, to be soon replaced by a new welfare hall. Calverton Football Club had won the Notts Alliance for the past seven years, and the colliery cricket club played in the Notts amateur league. The St. John ambulance division had a strong cadet section, and a flourishing judo club had well over fifty members.